Wow, is just one of many words I could use to describe Katie and Greg’s wedding at the Soaring Eagle Casino in Mount Pleasant. Going back to when I first met them they were like most brides and grooms in that there were looking for a DJ to provide them with the vision they had in mind. Katie said that the DJ was one of the most difficult decisions as Greg is really into music and their family and friends love to dance. They also wanted a “club” feel while still keeping it a wedding, which makes sense being at a casino. So having a DJ that not only understood their vision but could also deliver was vital. Their ceremony was held across the hall from the ballroom at Soaring Eagle and was personalized by having a friend not only marry them, but also play the guitar for their music. Adam Parr put put together a very personal and meaningful ceremony just for them; check out Adam’s blog post for all of the details. Cocktail hour immediately followed in a curtained off section of the ballroom which was rocked by the Michigan Trail Jazz Band who also played through dinner. While far from the bright lights of Vegas, their wedding fit perfectly with the casino. Top That Events completely altered the ambiance of the banquet room with pipe and drape, up-lights, and matching lounge furniture strategically placed throughout, which added to the club feel that they were looking for. Katie and Greg are big MSU fans, having attended they wanted to make sure green and white was represented in some way. Not only did they have green and white accents, they had an amazing ice bar with a Sparty head for the martini luge. 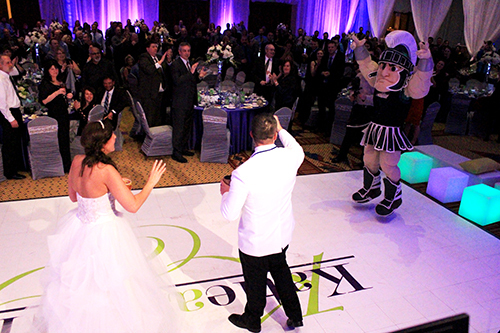 They thought that this was all the MSU they would get at their wedding; however, Katie’s parents had a surprise…they invited Sparty! 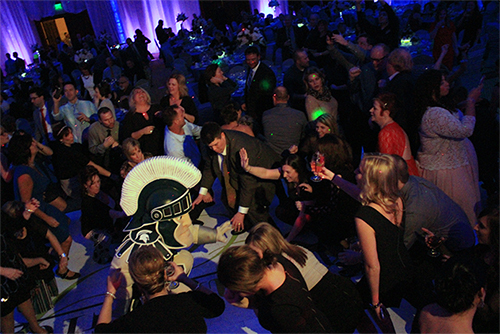 We kicked off the dance floor with the fight song and did a surprise introduction of Sparty into the room; it was on from there! The dance floor was full from the first dance song to the last dance song over five hours later; you read that right, over five hours of non-stop dancing! The best part was checking out of our room the next day and guests still raving about the wedding. Great DJs + Great Crowds = EPIC Weddings! Their wedding was indeed Epic. 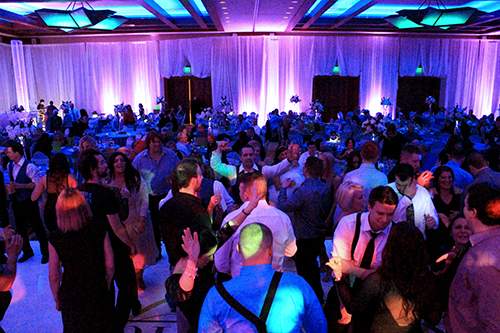 Keep your dance floor full, Contact Music Box Productions today to reserve DJ services for your Michigan Wedding!